The new school year has started. When the kids have trouble with their homework we often find ourselves searching the web for answers. When we use the Swagbucks search engine we find more than just answers to homework. Swagbucks is a rewards site where you earn points (called SB) for things you’re probably doing online already, like searching the web, watching videos, shopping, discovering deals, and taking surveys. Then you take those points and exchange them for gift cards to places like Amazon, Target, or PayPal cash. 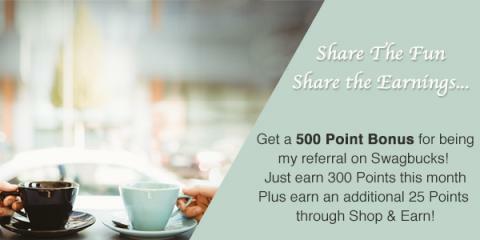 All throughout September you can earn large bonuses when sign up as my referral on Swagbucks. 3. That’s it. It’s super easy, and Swagbucks is for real. I use it myself, and I’ve earned Amazon, Shutterfly and Cineplex gift cards. This summer we took the family to see Christopher Robin and Incredibles 2 using the gift cards we earned through Swagbucks.